FOXERS sizes have changed slightly for a better fit. We have listened to your feedback and responded with new sizes that have been wonderfully received. Since FOXERS ride low like mens' boxers, the measurement should be taken where a pair of low rise jeans would be worn. 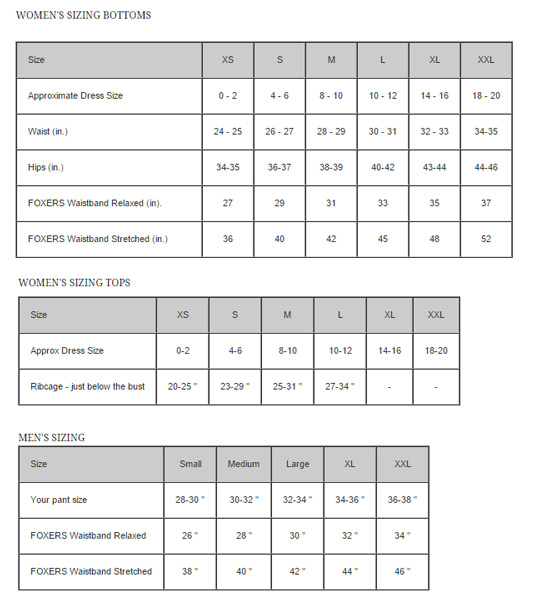 Also, the maximum stretch indicates the maximum hip size each pair will accommodate. Wondering, how do I measure myself? Click Here. Waist Size 28-32 " 30-34 " 34-36 " 36-38 " 38-40 " 40-42 "
Ribcage - Relaxed 25 " 26 " 28 " 30 " 32 " 34 "
Ribcage - Stretched 31 " 34 " 37 " 38 " 40 " 43 "
Your pant size 28-30 " 30-32 " 32-34 " 34-36 " 36-38 "
FOXERS Waistband Relaxed 26 " 28 " 30 " 32 " 34 "
FOXERS Waistband Stretched 38 " 40 " 42 " 44 " 46 "
Find the narrowest place between your hips and your ribs, when you twist to one side you should find natural indentation in your torso. This is your natural waist. Run tape around natural waistline, keeping tape parallel with floor and one finger between body and tape for a more comfortable fit.